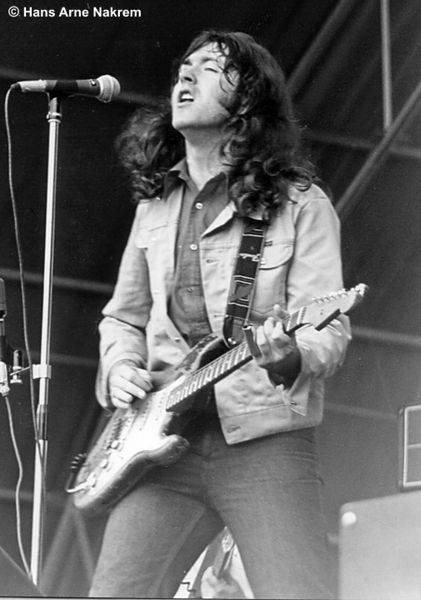 The “lost” Rory Gallagher album “Notes From San Francisco” whilst it is a worthwhile purchase for Rory fans it is not the best entry point for new fans. If he is new to you his heritage is still readily available, “Live In Europe” and “Irish Tour” are must have records as it was in live performance where Rory was most at home. Someone once asked Jimi Hendrix what is it like to be the world’s greatest guitar player and his answer was “don’t know ask Rory Gallagher” !! 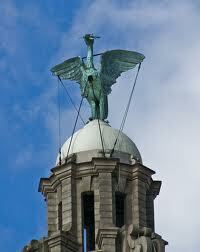 The above picture is of the two birds that top the clock towers on the Royal Liver Building, at Liverpool’s Pier Head, overlooking the River Mersey. 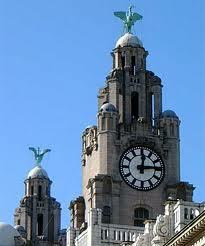 The building, now headquarters to the Royal Liver Assurance, is probably the best-known in the city. Each tower is topped by a metal sculpture of a cormorant-like liver bird, designed by Carl Bernard Bartels and constructed by the Bromsgrove Guild. The Liver Birds is a British situation comedy, set in Liverpool, Merseyside, which aired on BBC1 from 1969 to 1978, and again in 1996. 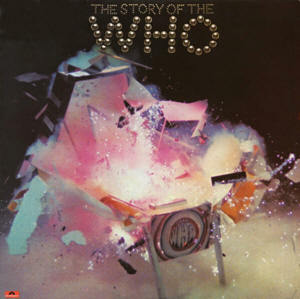 It was created by Carla Lane and Myra Taylor. The two Liverpool housewives had met at a local writers club and decided to pool their talents. Having been invited to London by Michael Mills (BBC Head of Comedy) and asked to write about two women sharing a flat, Mills brought in sitcom expert Sydney Lotterby to work with the writing team. 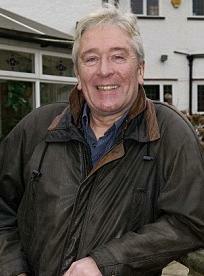 Lotterby had previously worked with Eric Sykes, Sheila Hancock and on The Likely Lads. Carla Lane in fact wrote most of the episodes, Taylor co-writing only the first two series. 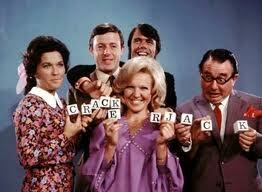 The pilot was shown as an episode of Comedy Playhouse, the BBC’s breeding ground for sitcoms, in April 1969. 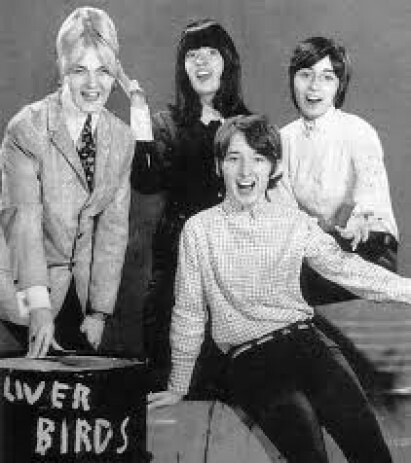 Finally there was The Liverbirds group who were a British all-female beat group, based in Liverpool, active between 1963 and 1968. The hard-rocking quartet (consisting of vocalist-guitarist Valerie Gell, guitarist-vocalist Pamela Birch, bassist-vocalist Mary McGlory and drummer Sylvia Saunders) was one of the very few female bands on the Merseybeat scene. Indeed, they were one of the few self-contained all-woman rock and roll bands anywhere in the world at the time. They achieved more commercial success in Germany than in their native land. Early in their career, they followed in the footsteps of fellow Liverpudlians such as The Beatles and Rory Storm and the Hurricanes and made their way to Hamburg, Germany. 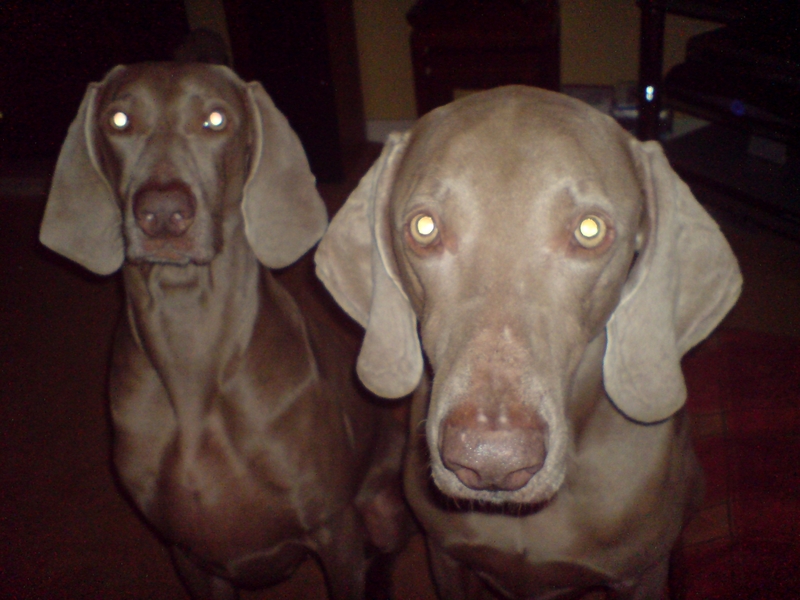 Here they are with a cover of a Chuck Berry classic. 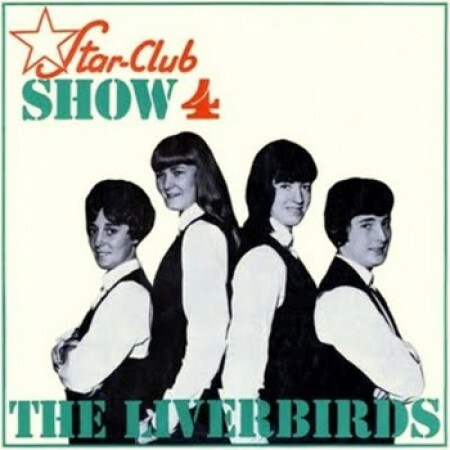 The Liverbirds were one of the top attractions at Hamburg’s Star-Club and they released two albums and several singles. One of those singles, a cover of Bo Diddley‘s “Diddley Daddy” rose as high as #5 on the German charts. They originally broke up in 1968, after a tour to Japan though they last played together in 1998. 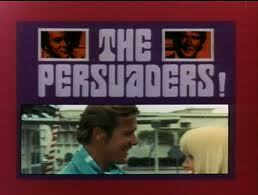 Here is a cover version of Tony Hatch’s famous theme tune by Roisin Murphy. This is a collaboration with an act called The Bullitts and appears to be part of an album coming out later this year featuring various artists (Murphy,Tori Amos, Mos Def) interpreting themes in this way. There’s a “video” or, as they call it, a Flixtape to go with this track (and the others so far). Every now and then there is a performance on Later….with Jools which catches the eye/ear, the latest being the 22nd April performance by Vintage Trouble. 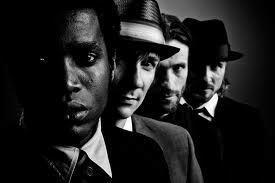 Vintage Trouble are a Los Angeles based primitive soul band and the brainchild of Ty Taylor (vocal) and Nalle Colt (guitar). Combining their love for original soul and rhythm & blues, the two set up a basic home studio in Venice Beach and started crafting the beginnings of Vintage Trouble. Already a friend of both, Rick Barrio Dill (bass) came along and added his shared bass influences and energy into the newly formed project. To make the band complete, Richard Danielson (drums) was recruited not long after to add the authentic and edgy take that was needed on the drums. With these collective energies and inputs in place, a new kind of soul band had been born with unlimited creativity and force. The foursome then moved to commune, create and rehearse in Laurel Canyon. Within two weeks of rehearsals in early 2010, the group quickly began playing local shows and late night speakeasies. Led by timeless vocal tone and presence, small tweed amps, and a mission to move as many people as possible, the band quickly gained a reputation as a high energy and truly mesmerizing live act whose performances feel like down-home revivals with an uptown edge. Sticking to their roots of mid-century original soul music and recording techniques, the band used a three-day recording session with full takes and no-frills to turn out 12 new songs a mere two months into the project. 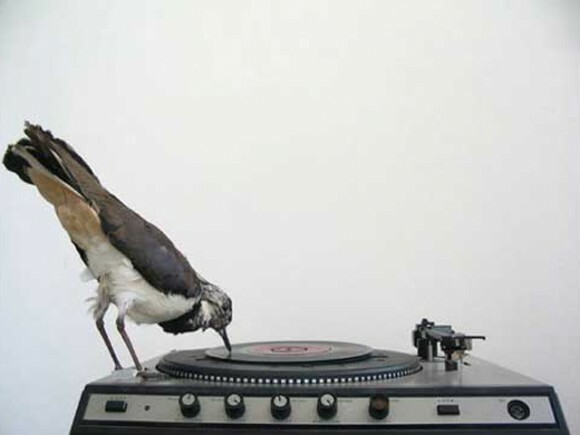 With singles like “Gracefully”, “Nancy Lee”, “Still & Always Will” and “Blues Hand Me Down”, the resulting sound brings you back to the days of vinyl records, sweaty juke joints, and the feel and essence of the original soul movement. 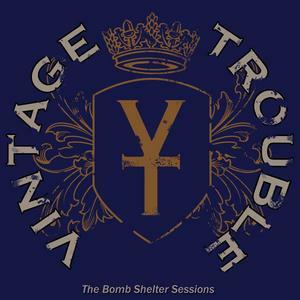 Vintage Trouble. It is obvious that more than just me were hooked with their performance on Jools as the band instantly sky rocketed to the 6th most trending topic of the day on Twitter Worlds Wide, becoming the #13 best selling digital album on iTunes, #5 all around best selling digital album on Amazon UK (beating out Rihanna and the current Glee (TV series) albums), #2 best selling digital rock album on Amazon UK, and #1 best selling R&B digital album on Amazon UK! They are slated to head out on tour with Brian May (guitar player of legendary rock band Queen (band)) and Kerry Ellis starting in early May 2011.